The team at Paperbark Literary Magazine recently came across the dynamic Double Edge Theatre Farm Center in Ashfield, Massachusetts. Our own Luke Canavan took some time to interview Stacy Klein, Founder & Artistic Director, and Cariel Klein, Associate Producer of Double Edge Theatre, to learn more about the programming there. Photo is from a rehearsal of SUGA. PLM: How was Double Edge Theatre founded? What is your mission and vision of the company? How does this tie in with your commitment to diversity? CK: Double Edge Theatre, an artist-led organization, was founded in Boston in 1982 by Stacy Klein as a feminist ensemble and laboratory of actors’ creative process. Double Edge Theatre’s mission is to create a “living culture” by developing the highest quality of original theater performances, based on the long-term imaginative work of its ensemble of artists and their rich interaction with the communities in which the work takes place—and by cultivating a permanent center of performance, training, research, and cultural exchange at the Farm in Ashfield, Massachusetts. Recently, Double Edge has expanded its “living culture” concept to include “art justice” and developed a group of long-term collaborators, who, alongside the DE international company, are developing programming that includes scholarship opportunities for underserved women, creative retreat and creation space with a focus on access for African American and Latino artists, and building a meetinghouse for native youth gathering named Ohketeau (to plant, to grow). PLM: Tell us about the Double Edge Theatre Farm Center. How does it influence training and performances? How does it guide the company’s mission? CK: In 1994, Double Edge moved from Boston to a 105-acre former dairy farm in rural Ashfield, MA to create a sustainable artistic home. Today, the Farm is an International Center of Living Culture and Art Justice, a base for the ensemble’s extensive international touring, with year-round theater training, performance exchange, conversations and convenings, greening and farming initiatives, and a popular indoor-outdoor traveling spectacle which takes place alongside the hills, pastures, river, and gardens of the Center. The DE facilities include two performance and training spaces, production facilities, offices, archives, a music room, outdoor performance areas, an animal barn, and vegetable gardens. There are also two additional properties: housing in the center of town for resident and emerging artists along with DE’s Artists Studio; and a design house, with design offices, studios, costume shop, and set, costume, and prop storage. A vision of future facilities includes a public archive/gallery, a meetinghouse called Ohketeau (meaning to plant something, to grow) which gives primacy to the voices of Native youth, and a fully developed farm. PLM: What kinds of theatrical performances does the ensemble tend to create, and what themes do you strive to communicate to the audience? CK: The Double Edge Ensemble, led by Stacy Klein, creates original theatrical performances that are imaginative, imagistic, and visceral. These include indoor performances and site-specific indoor/outdoor traveling spectacles, both of which are developed with collaborating visual and music artists in a long-term process and presented on the Farm as well as on national and international tours. Performances awaken spectators to new possibilities of the human heart and mind. 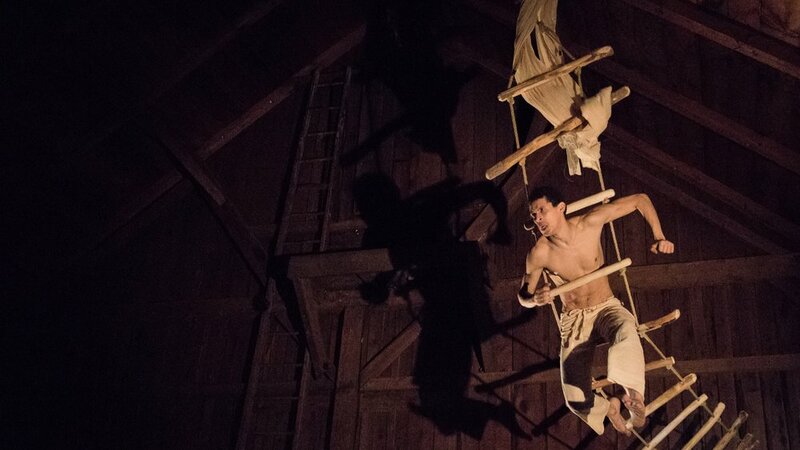 They explode past the limits of the stage and landscape with a “flying” aesthetic, a richly sensory, dreamlike storytelling that breaks the conventional boundaries between performer and audience. The prevailing theme of all of DE’s performances are the courage and necessity of the imagination in the progress and sustainability of human life. PLM: Your performance We the People seems to focus heavily on our relationship with the environment as human beings. Tell us a little bit more about the performance and how it came about. CK: We the People and Leonora’s World investigate how we as human beings value and interact with the land as well as how we can bring our fellow citizens of the world to appreciate the environment and our role in sustaining it. In We the People, several of the characters are directly dependent on the land, one as a farmer and one as a hermit. But all the people recognize the nature around them and their place among the animals and on the land. In Leonora’s World, the artwork of Leonora Carrington is used to investigate the fields, the water, and fire on cold nights of the fall. Her paintings of humans in the realm of animals and ruins of ancient buildings in the landscape allowed us to examine these relationships deeply. But for many years the environment has been a big theme of DE as we try to make our Farm Center sustainable as well as our art, recognizing the essential topics of our times. Cada Luna Azul (Once a Blue Moon), for instance, deals with a flood in South America caused by man’s intervention in the rain forests. PLM: What does a typical Double Edge Theatre training program look like, and how does one sign up? CK: Double Edge Theatre offers training immersion and intensive programs on-site at the Farm, directed by Associate Director Jeremy Louise Eaton, as well as single workshops and longer residencies off-site. These trainings are held at universities, and, in conjunction with performances, at high schools, theaters, and community venues. Physical training, involving a total body experience including running, partner work, and work with large objects. Although vigorous, the process allows any participant to fully engage. Etudes and Presentations, created from improvisation and individual work; scenes are created and built using music, art, video, dance, and character to create a unified piece. The goal is to translate training into a devised work process. Scholarships are available for all training programs through the Timothy O’Brien Fund, the Uriona-Klein International and Latino Training Fund, the Vidya Ramanan and Visalakshi Naranan Fund, and the Supporting Black Lives Fund. If you are interested in signing up, email Travis Coe at training@doubleedgetheatre.org or call (413) 628-0277. PLM: What is the best way to support Double Edge Theatre? CK: See a show, volunteer, become a member, take a training program, or spread the word.